A little more than an hour train ride south of Tokyo sits Kamakura. Like Kyoto and Nara, Kamakura is a former capital full to the brim with temples, shrines, and a bounty of historical sites lining its winding streets. Nestled in a cozy bay with beaches and a giant Buddha tucked amongst the rest, it's a city that invites multiple visits if not at least one. And those seeking a farmers market well-stocked with traditional vegetables, skilled growers ready to share recipes and chat about their wares, along with some nifty prepared foods to rejuvenate themselves after so many temples surely won't be disappointed, either. Started nearly twenty years ago, the Kamakura Farmers Market or Kamakurasui Nyogyou Rensokubaijo, runs seven days a week nearly year-round. 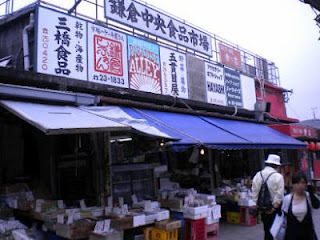 A ten-minute walk from the station, the market is located in what at first glance looks like nothing so much as a run-down warehouse where a slightly senile sign collector resides. Having a neighbor like Patagonia on one side only further enhances its eccentric qualities, but those interested in vegetables, good traditional food, and a look at locals doing what they do best - producing whole foods your taste buds don't even know they fancy yet - should not be deterred. 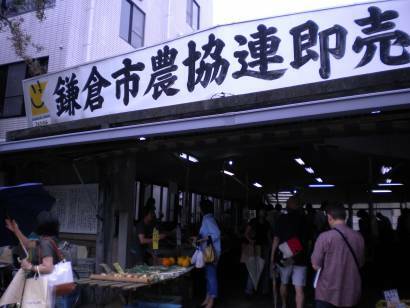 The market is an outlet for a locally created brand - Kamakura Brand - of traditional vegetables and goods that is complete separate from Japan Agriculture (JA) and well-regarded for its high quality. It is also well-stocked with farmers. Four different groups come to the market on a rotating schedule that roughly averages out to just about every four days. (Hint: If you find someone you like, find out when they will be back again.) Each grower brings in the fruit of their fields harvested that morning or shortly before as it comes into season. Our visit on a grey Sunday meant slightly lower numbers of vendors, but it also meant a better opportunity to chat and peruse. Plenty of local shoppers seemed also to be on hand talking with the farmers while picking up a few things. Tourists, like our little group of four, ventured in tentative at first but were soon emboldened by friendly farmers, reasonable prices, and the occasional new vegetable. (One women I heard chatting with a farmer had never seen daikon thinnings before, and was grilling the grower on preparation specifics.) As I waited to purchase a purple basil seedling (I have mentioned my penchant for purple before.) and listened to their conversation, another group of ten were towed past by their clipboard endowed guide. One organic farmer I talked with, Yoshiaki Ishiou, said his grandfather had been selling at this market since the local cooperative first opened the doors. I imagined someone like him - tanned and wiry from long days in the field - standing at a similar table heavy with seasonal bounty. Drawn like so many others to his table by the bright yellow and orange Italian salad squash, it was a little tricky to get a word in between sales and customer questions. When I mentioned that the farm I work on in Tokyo sells some of our produce to Ito Yokado (a large supermarket chain in Japan) he gave me a taste of the kind of passion and local pride that surely helped found this market and the brand. "Ito Yokado has no face. This vegetable," he said picking up a yellow salad squash from the table, "is my face." I bought one on the spot as any grower with that much belief in his work and land must be producing something worth supporting. A new ingredient for our salad seemed like the least I could do. *No official hours are posted, but these ought to be a safe bet. Great news, Jessica!! I'm sure you'll love it. I'd recommend going on a few different days of the week to get a feel for which vendors are there when. The schedule does alternate. Have fun exploring! What days is the kamakura ichiba closed over 2013 new year's season? Still searching. Their website does NOT say, which is weird. Oh, excellent question! I am really not sure, although I would guess that the market would be closed beginning a day or so before the New Year holiday, and possibly remain closed until about a week later. Most of the Tokyo markets did that and our local farmstands did, too. One of my favorites, too. Thanks for the article. Why, oh why, don't they post their hours on their website? Can we really make the longish trip from Tokyo just to find them closed for some reason (outside of national holidays)? Otherwise, it is a real jewel. I toss Y300 to keep a locker just outside the station, go to the ichiba and usually buy a crazy huge amount of great food/bread, haul it back to the locker, and keep it there while running Kamakura. End of the day, I retrieve everything from the locker and haul it home to Tokyo. This method works well. Get the locker first as sometimes they can all be reserved by the mobs of tourists. That is a good question. I have seen Swedes/rutabegas occasionally at the UNU and Earth Day Markets. I wouldn't be surprised, though, if they also turned up at this one. 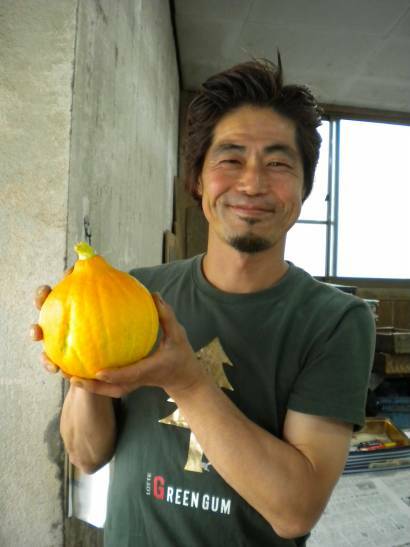 The Kamakura farmers are pretty innovative and curious. They are always doing something exciting.